25 pcs • Net Weight: 24 oz. (1 lb. 8 oz.) 682 g.
Wheat Flour, Water, Soy Bean Oil & Salt. 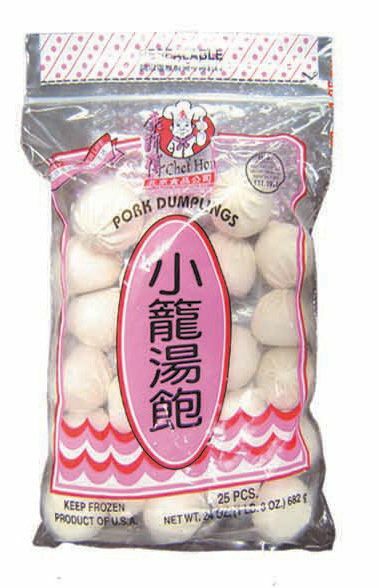 Pork, Pork Fat, Water, Scallion, Soy Sauce (Water, Soy Beans, Wheat, Salt, Sodium Benzoate Less Than 1/10 of 1% As Food Preservative), Sherry Wine, Ginger, Sesame Seed Oil, Monosodium Glutamate, Dark Soy Sauce (Water, Rice, Wheat, Salt, Caramel), Soy Bean Oil, Salt, Sugar & White Pepper. Add enough water in steamer. Heat water unitl boiling, then place dumpling to steam for about 12 to 15 minutes. The internal temperature of 165F is reached as measured by the use of a food thermometer.